This week was a wild one, which explains the reduced number of blog posts. Saturday was Emerson's school's spring fair which included a talent show. Emerson performed, singing the song “Stay” (we changed rum and cola to Coca Cola). Right after we headed to our friend's baby shower. Sunday I met ump with eight friends from college at our alma mater for brunch and a tour around town, including the sorority house. Monday I flew to California for an event with the clothing company cabi. 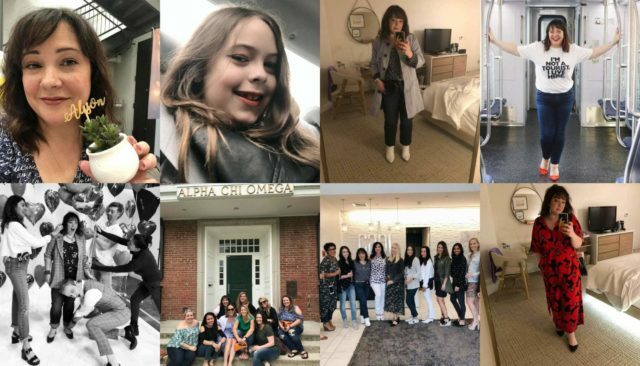 Each year they have Blogger Day, where they invite 8 bloggers to their headquarters to see the offices, the staff, learn more about the company and their charity, and to get a sneak peek of the upcoming fall collection. I'll be sharing more about this trip on the blog in the future, but you can also see my InstaStories (on my profile page there's a highlight button of the stories from the day). I flew back Wednesday, getting home very late. Thursday was jam-packed with calls, deliverables due, and Emerson's homework. By Friday, I woke up completely worn out. I called out for the gym, got another hour of sleep so I'd be able to make it to the weekend. Looking forward to some downtime with my family! As someone who worked in retail for many years and to this day can hear a song and remember the smell of a store's backroom or a certain beauty product or the taste of a Nordstrom Ice Storm I often consumed for breakfast before double shifts I found this piece on who picks store playlists interesting. In case you care, You're Not Alone by Olive will forever remind me of the Gucci-inspired satin shirts and velvet jeans collection from Express Fall 1997, There Must be an Angel from Eurythmics smells like Five Hour Energy and cardboard (AKA late nights during the holidays restocking the sales floor), and Madonna's Don't Tell Me smells like Exotic Home Fragrance Oil. And related, found in the comments of the Racked post – if you worked at Gap from 1992 to 2006, this blog lists all the playlists the company used! J. Crew has come out with their best-selling toothpick jean, now in a curvy fit. Better for those of us who have a booty and hips, it's shaped more for an hourglass shape. Unfortunately, the jean only goes up to a size 32. Stop playing games with our heart J. Crew. Increase your size range, keep your quality consistent, and have fewer ruffles and more classics and maybe you can get out of your billions-dollar debt! Pretty cool – Oscar De La Renta partnered with a Maryland native to design hoodies for the specific needs of cancer patients. A few of you have written to me raving about Soma's Smoothing Shorts. Not Spanx, these are very lightweight slim shorts you can wear under dresses to prevent chub rub. A couple of you prefer these to Jockey Skimmies for weight and durability; I'm going to have to try them and report back! You know when you see an outfit on someone and find it fantastic but can't really figure out why it's so great? Brenda Kinsel, fabulous woman and stylist breaks it down with a fantastic example she saw at the Petaluma Antique Faire. I love Drew Barrymore, but the concept of her Netflix show, Santa Clarita Diet left me cold. Then one day I decided to check it out and I am now obsessed. This is NOT a show to watch while eating dinner (Karl won't watch it because he sat down right at a point that involved a foot), but I just find it utterly hilarious. Have you watched it? Do you dare? I looked at the J. Crew website and those jeans now to up to size 37! Ok ok now you have piqued my interest and I’m gonna have to watch it! Lol never even heard of it before this . I love Santa Clarita Diet. It’s ridiculous and funny. But we do wait until we’ll after dinner to watch it. I’m a Santa Clarita Diet fan too. If you make it through the first episode, which left me feeling a bit nauseous, you’ll be hooked! I love Timothy Olyphant. The dialog is so witty. He and and Drew Barrymore are wonderful together.